Volatility is an interesting measurement to judge the health of equity markets. As a mean-reverting price series it always returns to its average over time – it doesn’t increase indefinitely nor can it stay low forever. But it also has a tendency to cluster: high volatility is usually followed by more high volatility and low volatility tends to stay low for some time. If you want to bet on future volatility, recent volatility (e.g. as stated by the VIX) is a pretty good place to put your money. This insight is quite useful on many levels and something I´ll go into it in much more detail in the next couple of posts. A team of academics (Alan Moreira und Tyler Muir) see an increase in annual returns of 2,4% on average when using increasing volatility to time the market and lower stock exposure. Because we all tend to suffer from recency bias, we often focus just on how well this worked in 2007, leading up to the financial crisis. But before the 2000´s bear market volatility started to rise consistently all the way back in 1996 – which makes the observation technically correct, but not very useful as it was just way too early. It is interesting to note, however, that volatility never came back down to pre-1996 levels during the epic bubble of 2000, but stayed elevated throughout. The correlation doesn’t seem to be that clear cut after all. When we look at the beginning of the data series (at VXO, a predecessor to the VIX) the 1987 crash and the smaller recessionary bear market in 1990 / 91 even saw volatility return to the lows of previous years just before it finally shot up in concert with falling stock prices – alas no proper warning there. Just recently, in March 2019, VIX dropped back to relatively low levels (below 13) while stock markets rallied fiercely after the sudden drop in Q4 2018. This put a favorite pre-October 2018 thesis back into the headlines: the melt-up of equity prices in a last euphoric blow off top for the current bull market. May the reverse observation hold true and the fall of the VIX to low levels signal an all clear for the coming months? We can go back to the phenomenon of volatility clustering, I talked about in the beginning. Empirically this is especially pronounced in low volatility environments. 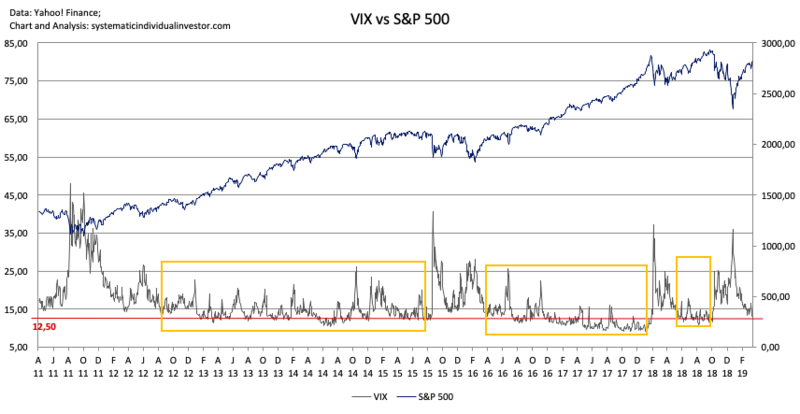 We can see this in the charts above: when, after a spike above 35 or so, the VIX falls back to low levels (below 15), it tends to stay in a suppressed range below 20 to 25 for several months. The most common value we find the VIX at over time (the mode) is 12,42. Such a low VIX range is typical for a rallying stock market interspersed by small pullbacks. This is also the „normal“ behavior of the stock market – most of the time it goes up. A simple coin toss at any given time has probability in favor of being long stocks: the chance to see a positive return in stocks over 6 months to one year has been above 70% historically. As for a warning signal, in case our high probability scenario is wrong, the VIX Futures Term Structure and its power to signal market regime changes will be the topic of the next post. We use different VIX Term Structure warning signals in our Meta Strategy. Learn more and subscribe to our newsletter detailing the tactical Meta Strategy ETF Portfolios here.